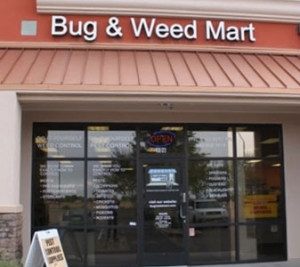 Bug & Weed MART’s Gilbert store is the newest location of the five Phoenix metro do-it-yourself, pest and weed control stores. We are easily accessible in a small strip mall on the east side of Gilbert Road just north of the San Tan Loop 202. Gilbert is well known for its small town atmosphere, though we have a substantial farming community, too. Because of all the agriculture in and around the area, weeds and pests of all kinds are always a concern. Let us help you figure out which pests you have, how to get rid of them, and how to prevent them from bugging you again. We also have a variety of pre- and post-emergent granules to control weeds from taking over your yard. Scorpions are always a problem, whether you live in town or in one of Gilbert’s more rural areas. We have granules that are used to eliminate these pesky critters and the products we carry are professional grade, yet safe around pets and children, usually odorless, and non-staining, too. Termites are a common problem, too, but we can show you what to look for and sell you the products you’ll need to get rid of them before they eat their way through your home. Our store managers are all Certified Applicators and can help you make the right purchase to get rid of all the pests and weeds around your home. We’ve been giving professional bug and weed elimination advice to Phoenix area residents for more than 35 years. Let us see how we can help you.